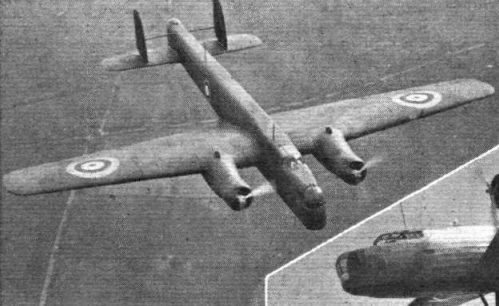 View of the Armstrong Whitworth Whitley which show its general proportions and the gun turrets in the nose. Machines of our first Blenheim unit - No. 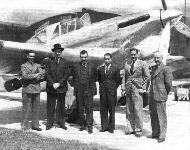 114 (B) Squadron at Wyton. These aircraft are by far the fastest bombers in service anywhere in the world. "Бленхеймы" I из 114-й эскадрильи, 1937г. 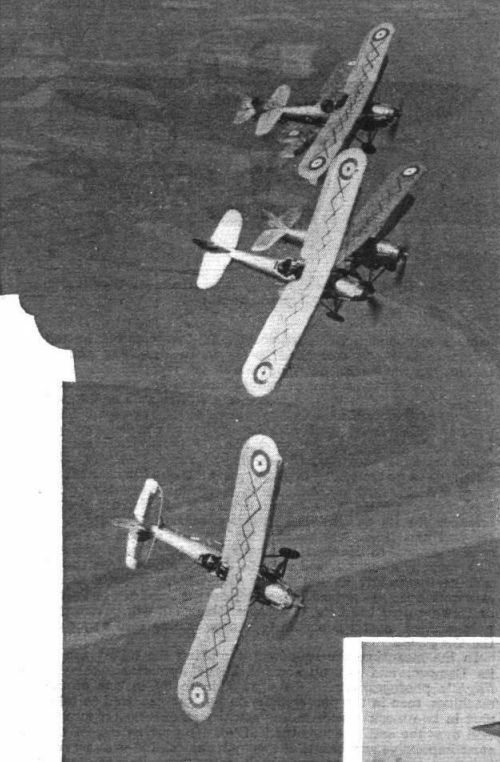 QUICK QUINTET: Another Flight aerial photograph of the first Blenheim unit at work. The dark camouflage finish heightens the impressive effect of the picture. The fine lines of the 280 m.p.h. 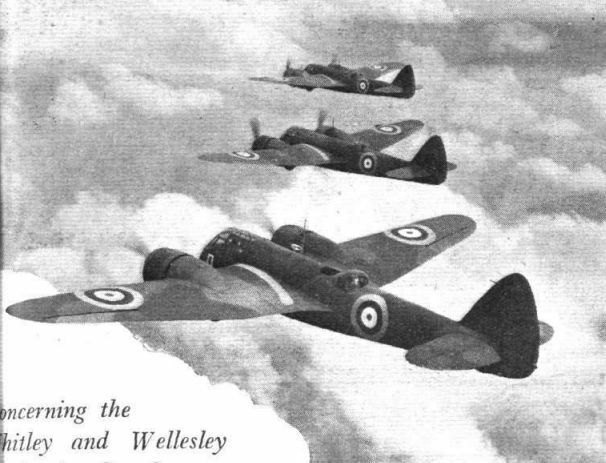 Bristol Blenheims of No. 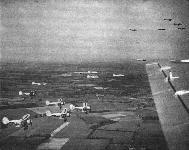 114 (B) Squadron are well brought out in this view. 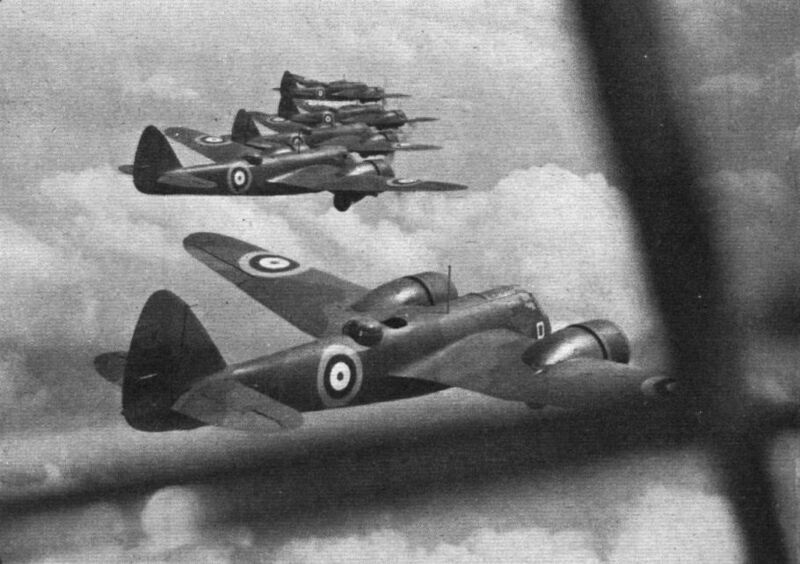 SWIFT AND PURPOSEFUL: Probably one of the most grimly Impressive photographs of its kind ever taken, this Flight picture shows our first Bristol Blenheim unit in the air - No. 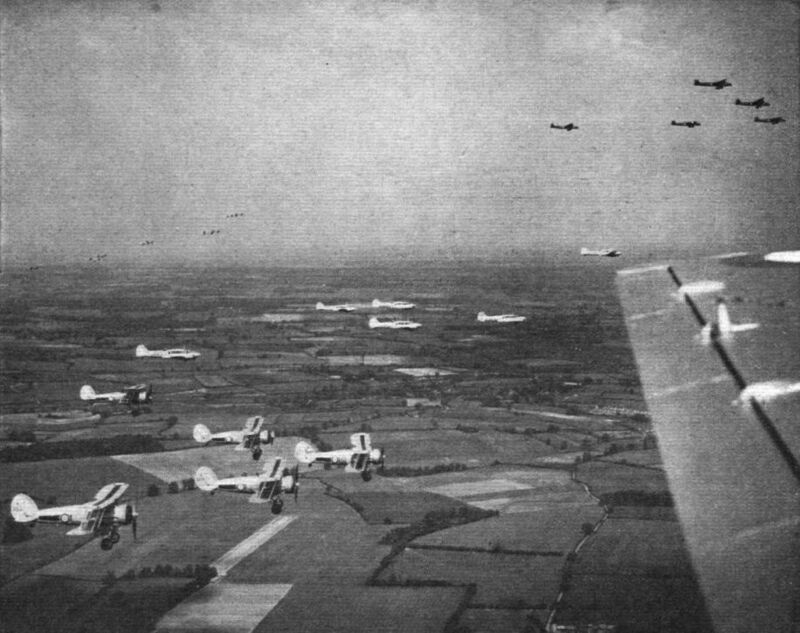 114 (Bomber) Squadron from Wyton, near Huntingdon. Equipped with Mercury VIII engines (825 h.p. 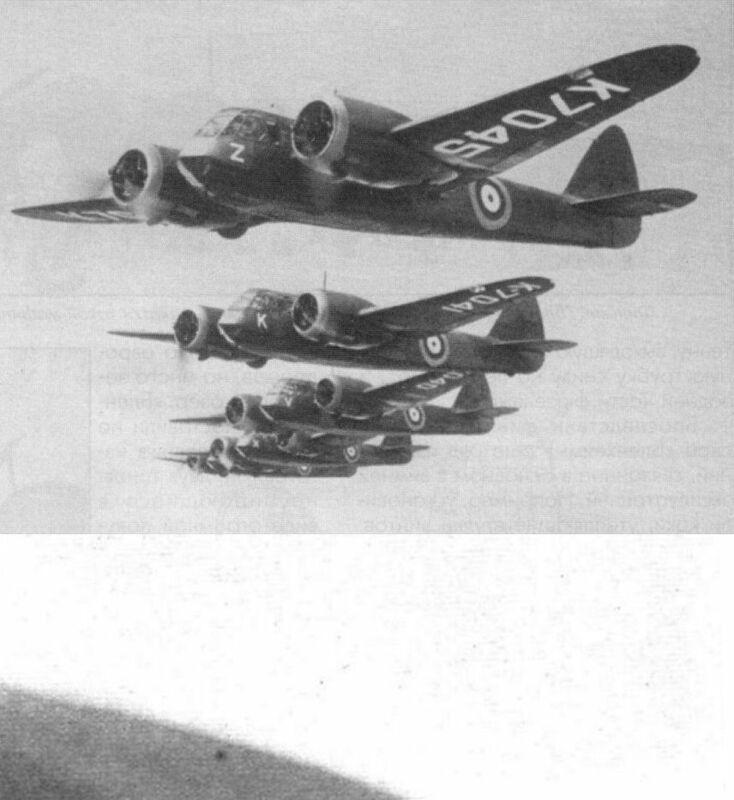 each at 13,000 ft.), the Blenheim is the world's fastest bomber. Normally a crew of three is carried. 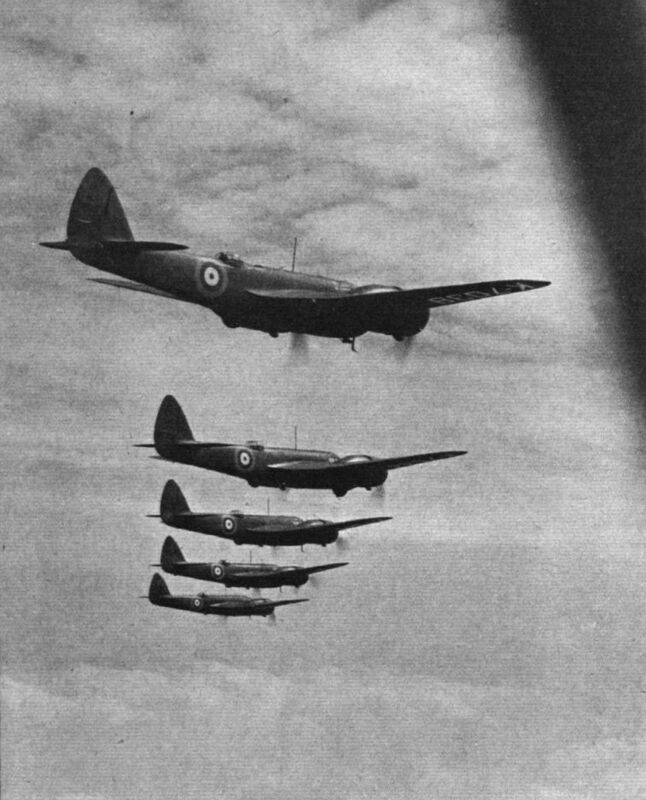 THE LADDER OF FAME: Bristol Blenheim medium bombers of No. 114 (B.) 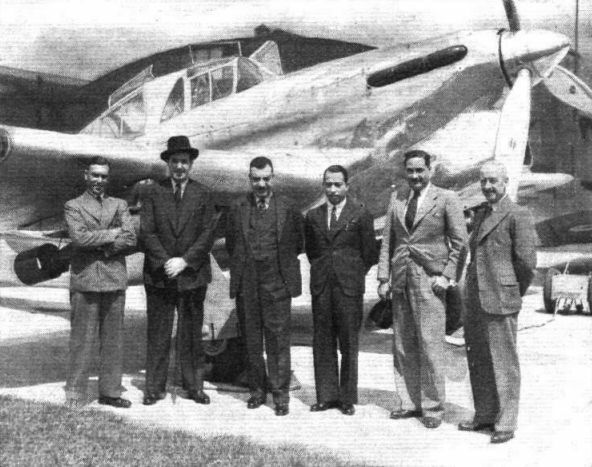 Squadron at Wyton. The degree of accuracy attained by this unit after only a few weeks' practice is apparent in this view of an echelon formation. 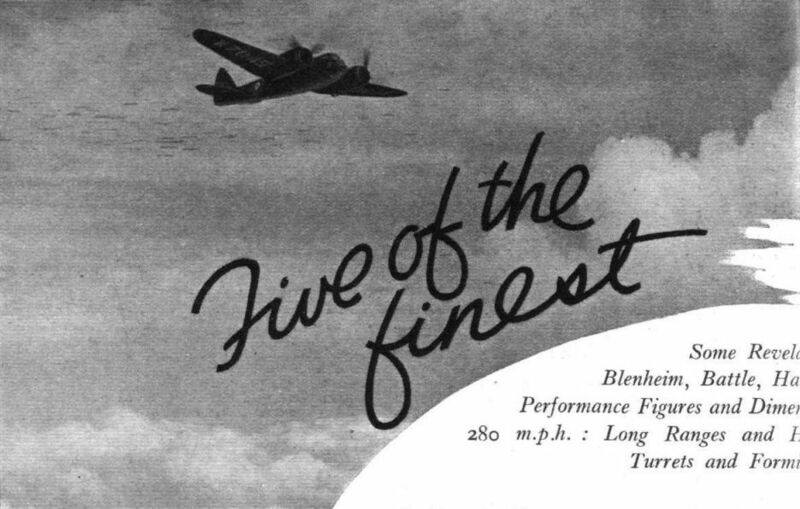 The Blenheims are probably the fastest machines in service anywhere in the world. A slow-flying demonstration by a Blenheim at Wyton. 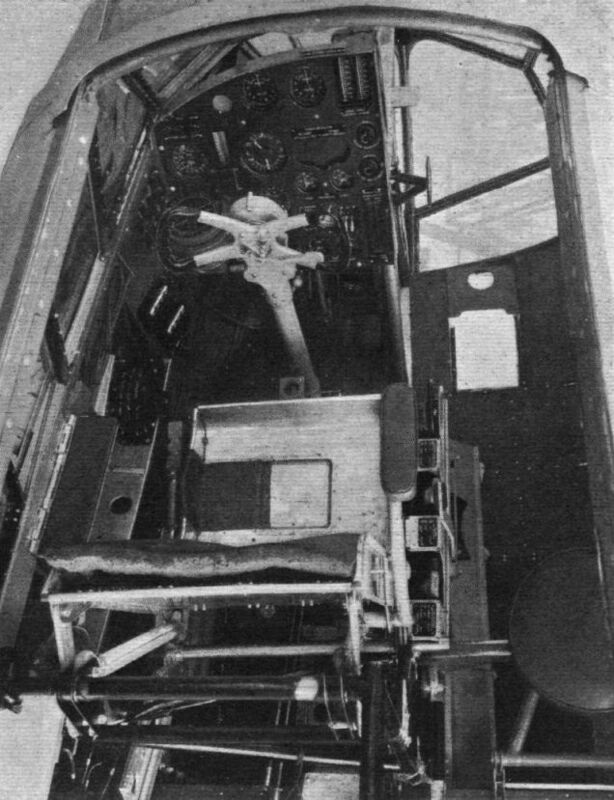 A plan view of the Blenheim's control cabin, showing the tidy instrument panel and giving some idea of the range of view provided for the pilot and bomber-navigator. On the right of the pilot's seat can be seen one of the two trimming wheels and the three hydraulic control plungers in line behind it; the trimming indicators are on the right side of the dash, while those for the undercarriage and flaps are on the left side of the cabin. 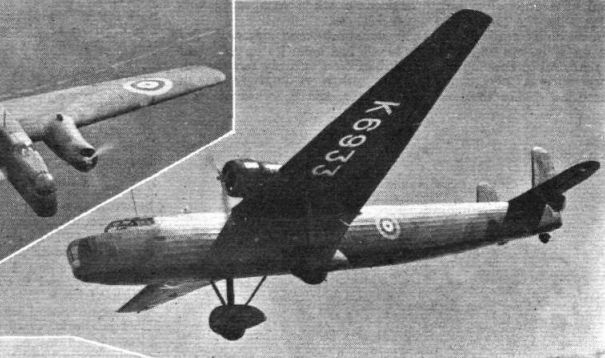 The fuselage of the Blenheim is made in three sections, each of a size suitable for transport. This sketch shows the tail unit with its retractable tail wheel, and the rear turret in its "flying" position. Details of one of the undercarriage units showing, in broken lines, the position taken up by the struts and radius rods when the unit is in the half-retracted position. 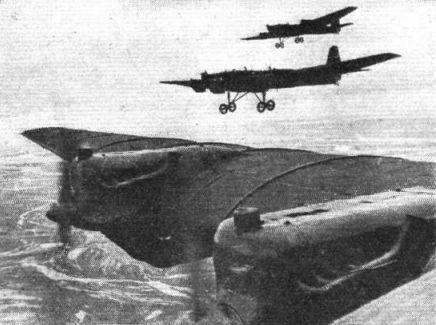 "Massive strength and rakish speed" (according to the picture agency's caption) are displayed by these A.N.T.6 bombers. 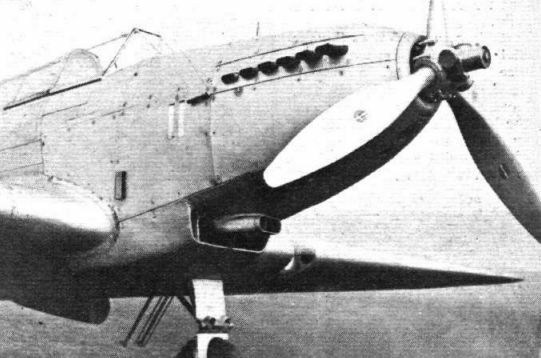 The Fairey Battle is the latest single-engined bomber to go into service. Its engine is the glycol-cooled R.-R. Merlin I, which gives it a top speed of 257 m.p.h. 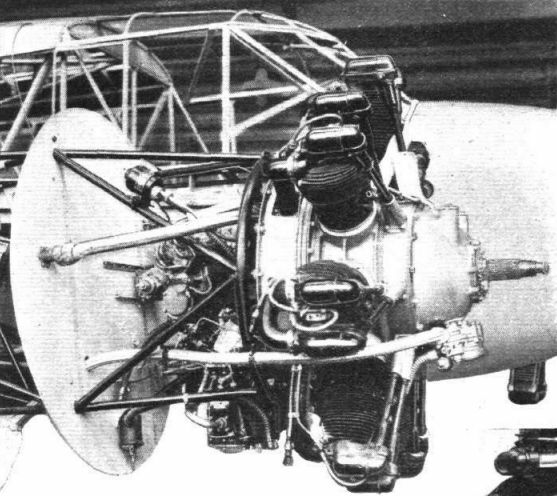 An uncowled Rolls-Royce Merlin engine in a production Fairey Battle reveals the down-facing carburettor in-take with its scoop, the separate radiators and details of mounting. 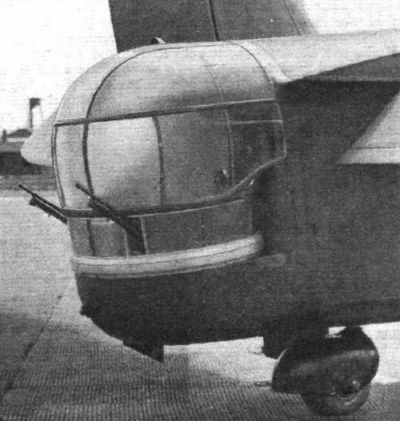 Tho location of such items as radiator, undercarriage and landing lights are shown in this view of the nose of a Battle. The clean installation of the 990/1,050 h.p. Merlin is noteworthy. The finished product faired and cowled. The latest type of exhaust manifold, shown in the first illustration, may be compared with the more familiar stubs seen below. 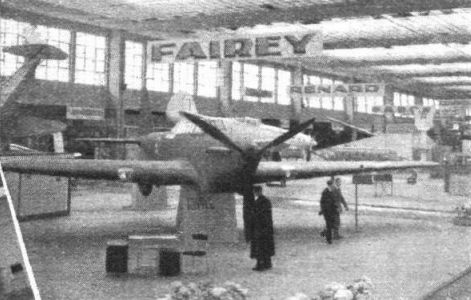 Grimly businesslike in its dark camouflage - the Fairey Battle, which is now being supplied to the Belgian Air Force. 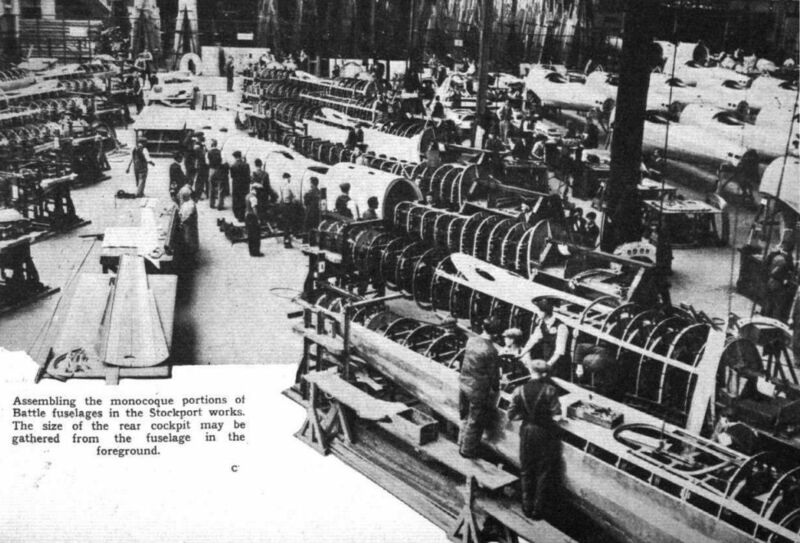 Assembling the monocoque portions of Battle fuselages in the Stockport works. 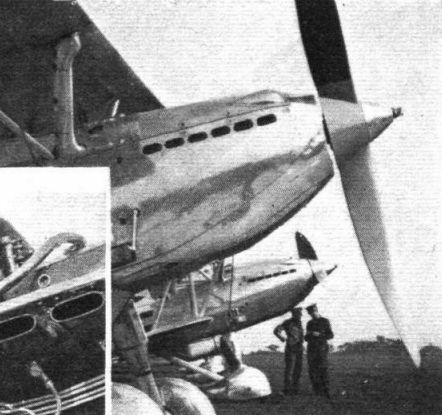 The size of the rear cockpit may be gathered from the fuselage in the foreground. 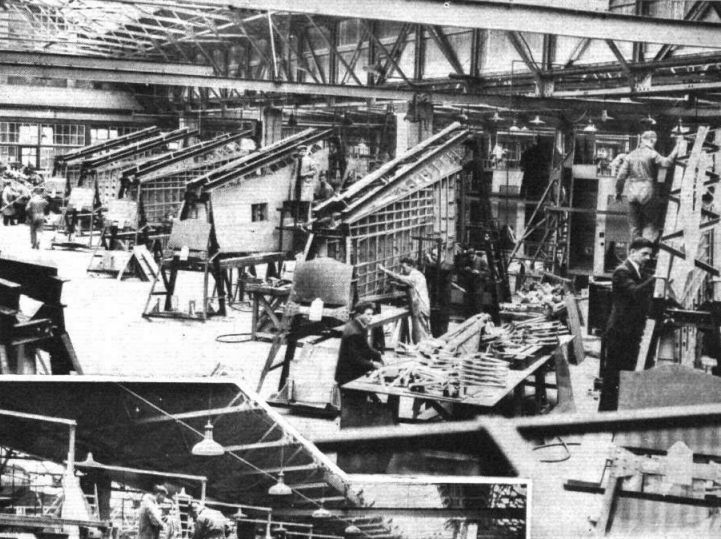 The main erecting shop at the Stockport works. 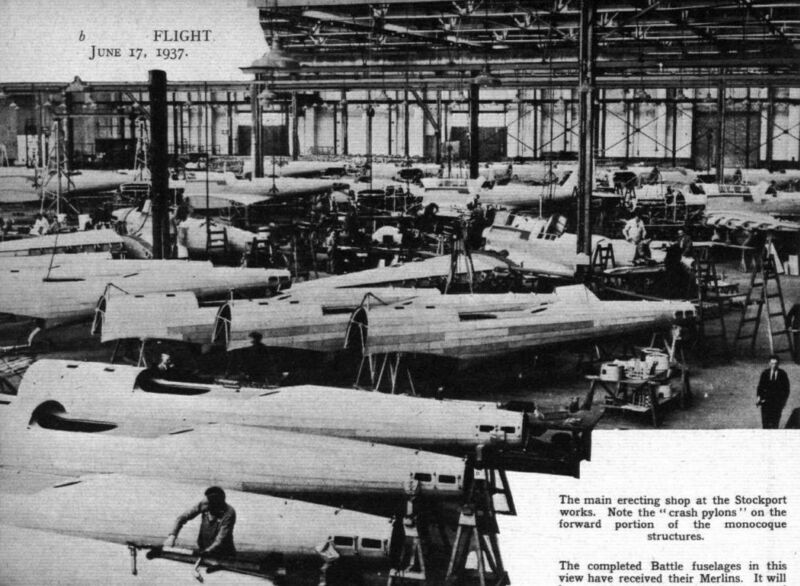 Note the "crash pylons" on the forward portion of the monocoque structures. The completed Battle fuselages in this view have received their Merlins. It will be seen that the first two bays are of tubular construction. 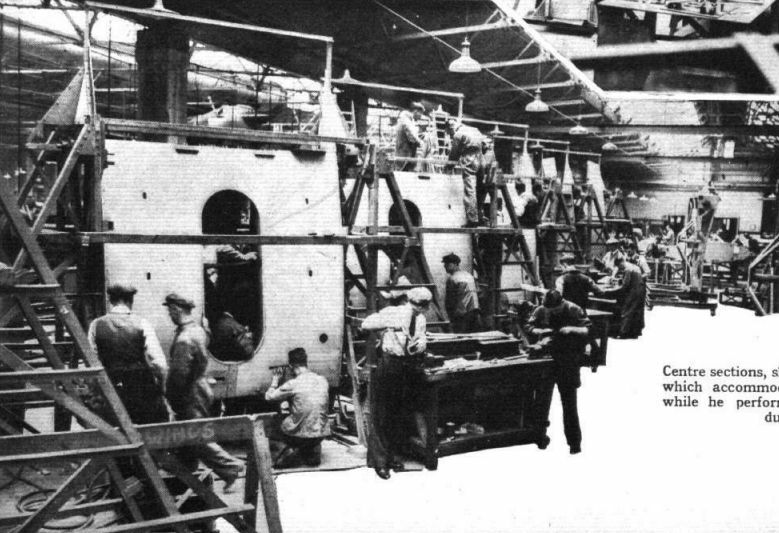 The outer panels of Battle wings are seen here taking shape. Note, near the roots, provision for the undercarriage and bomb storage. Centre sections, showing the "well" which accommodates the observer while he performs certain of his duties. 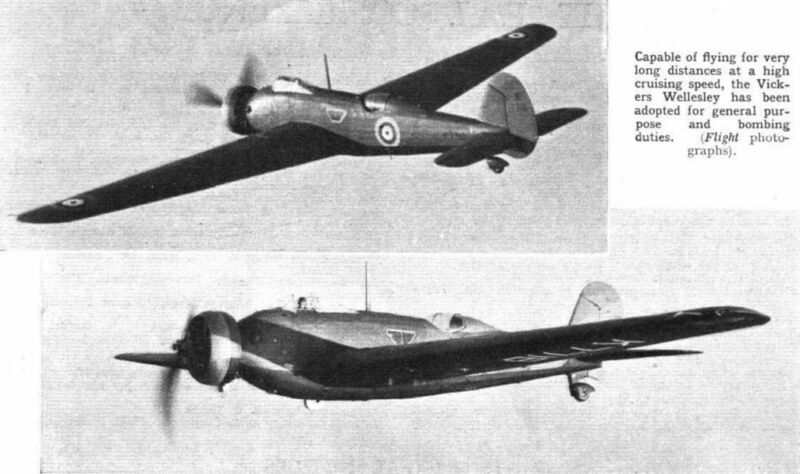 An interesting comparison of open and closed cooling gills on the Westland Lysander with Bristol Mercury VIII engine is seen in these two photographs, taken immediately prior to take-off and just after take-off. MILITARY MILES: A Miles Magister trainer (130 h.p. D.H. Gipsy Major) as delivered to the R.A.F. The Magister is a development of the Hawk Major series and is fitted with a new pattern of undercarriage. It incorporates, of course, Miles split flaps. Under the shining "bonnet" of the Miles Magister is a De Havilland Gipsy Major engine. 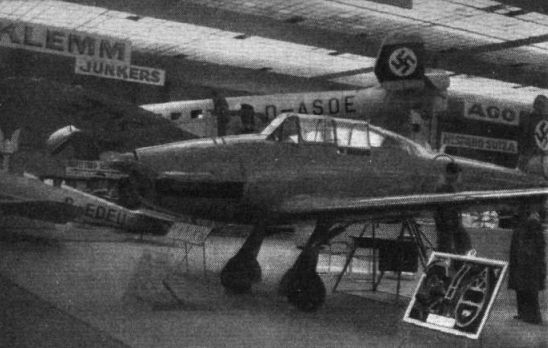 AT THE BRUSSELS SHOW: A new German two-seater military trainer, the Arado Ar.96. 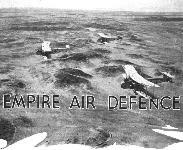 It provides for instruction in flying, radio, gunnery, photography and bombing. The engine is a 240 h.p. inverted vee-eight Argus. 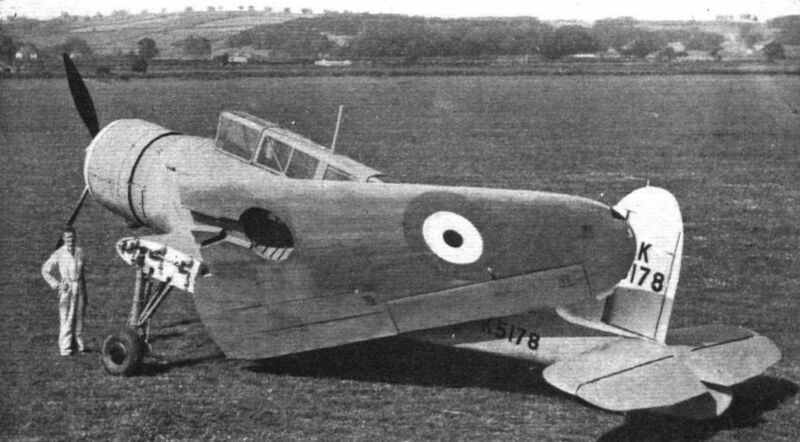 The De Havilland Don advanced trainer, ordered in quantity for the R.A.F., is fitted with the D.H. Gipsyking inverted vee-twelve engine, better known as the Gipsy Twelve. 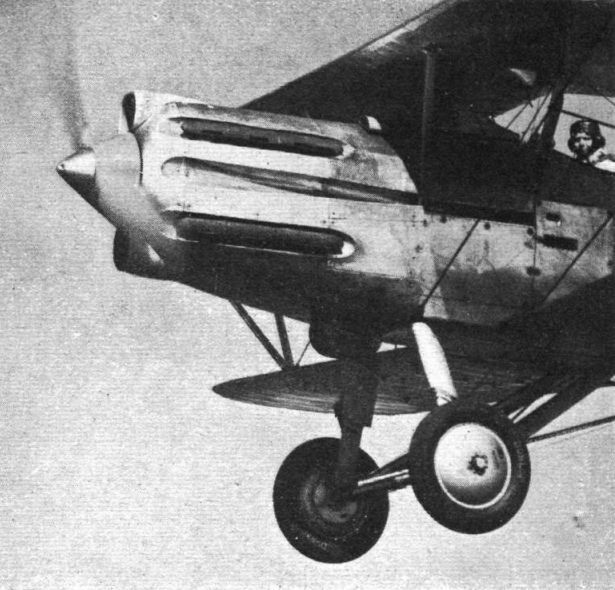 Gladiators are the best, and perhaps the last, biplane single-seater fighters to be issued to the R.A.F. Capable of flying for very long distances at a high cruising speed, the Vickers Wellesley has been adopted for general purpose and bombing duties. 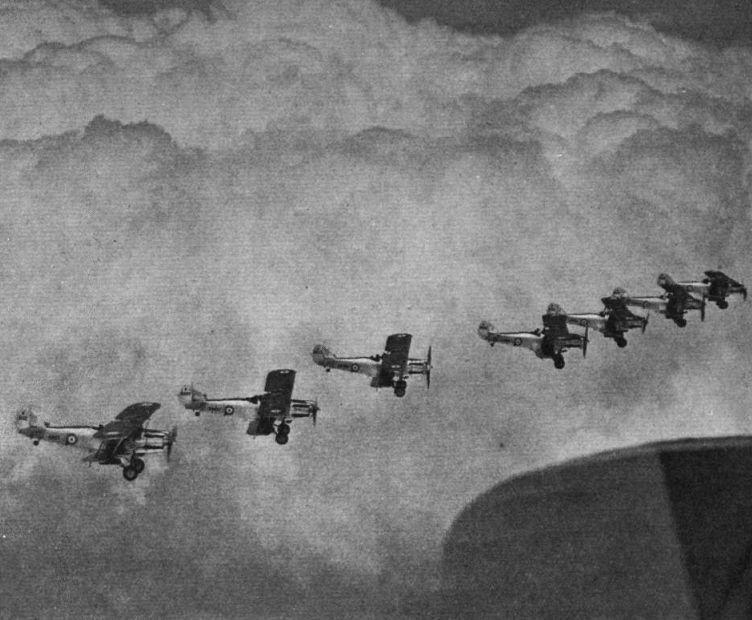 Gloster Gauntlet fighters in squadron formation. 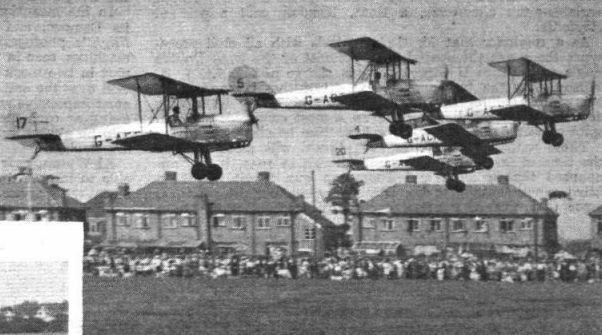 SKY PARADE: Gauntlets, Ansons and Harrows in a "skeleton flight" rehearsal for the massed fly-past which will feature in the RA.F. Display to be held at Hendon on June 26. It is to be hoped that the squadrons will fly at closer intervals and at a lower altitude than did those in the so-called fly-past of two years ago. In this handsome photograph of a Hector's nose, the countersunk exhaust manifolds, streamlined air cooling and air intake scoops, and oil radiator are characteristic features. No. 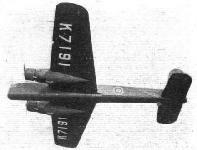 13 (A.C.) Squadron, at Odiham, is the first unit to be issued with Hawker Hectors, which mount the 24-cylinder Napier Dagger III air-cooled engine. On the photo, Sqn. Ldr. S. H. C. Gray is posing his machine for our photographer. Sqn. Ldr.. S. H. C. Gray, O.C. No. 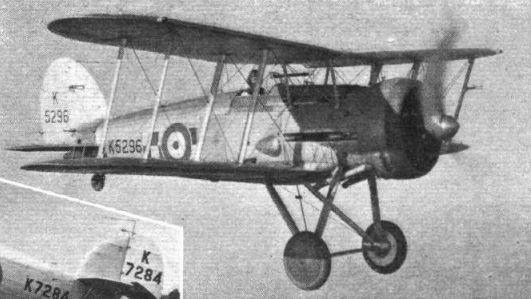 13 (A.C.) Squadron, in his Dagger-engined Hector. This view shows the countersunk exhausts, which act as admirable flame-dampers. The first Daggers in the Service: 200 m.p.h. 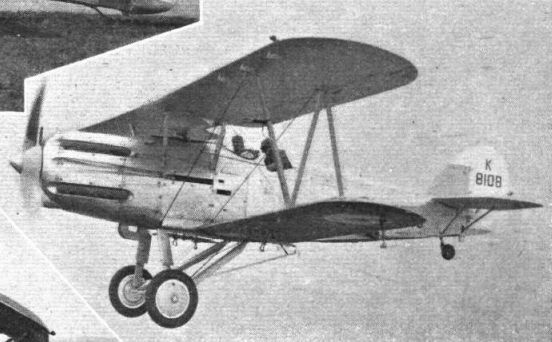 Hawker Hectors of No. 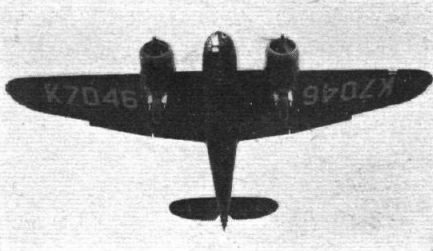 13 (A.C.) Squadron, which are fitted with Dagger III engines. Hectors of No. 13 (A.C.) Squadron, Odiham, practising an echelon formation above the clouds. R.A.F. MOBILITY: The Vincents of No. 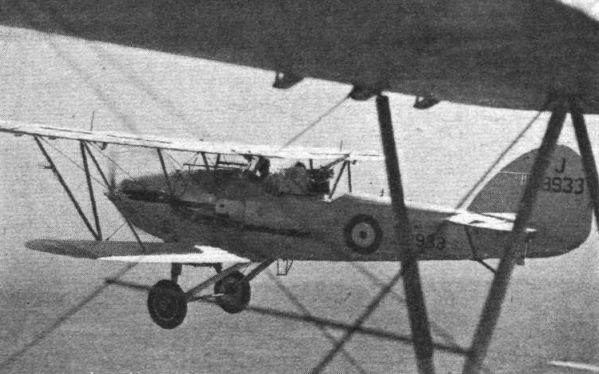 84 (Bomber) Squadron from Shaibah, near Basra, receiving fuel and routine attention when on an inter-command flight across India. 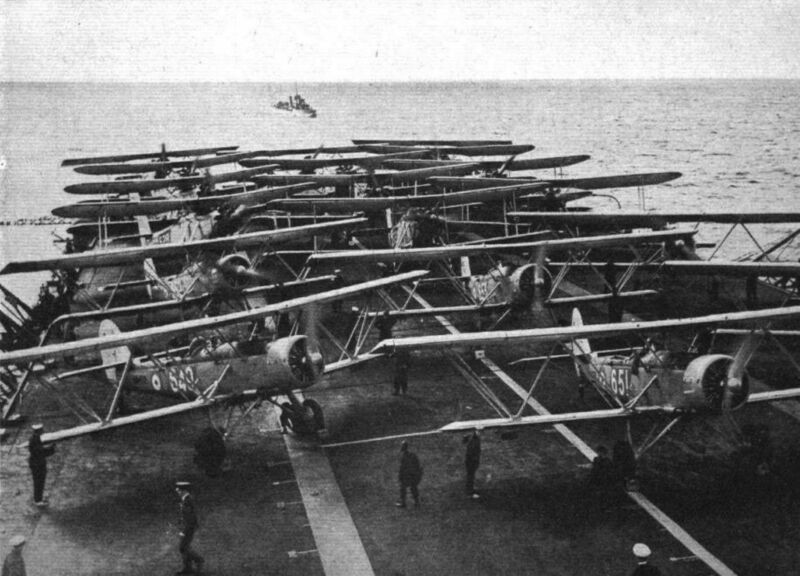 "The aircraft to be flown-off are brought up on the lifts from the hangars below decks and are ranged up behind each other on the flight deck. Often two or more squadrons are so ranged up at the same time." Sharks and Baffins are seen in this striking photograph taken on board H.M.S. Courageous. 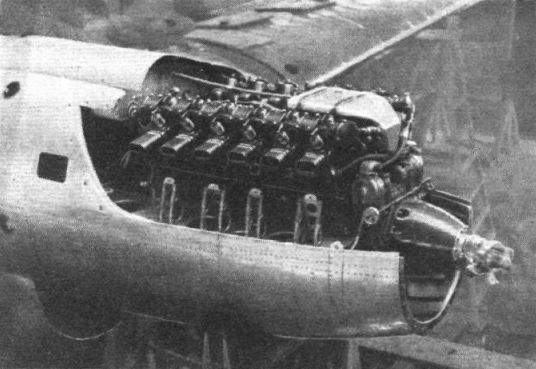 One of the seven-cylinder Armstrong Siddeley Cheetah IXs installed in an Avro Anson. 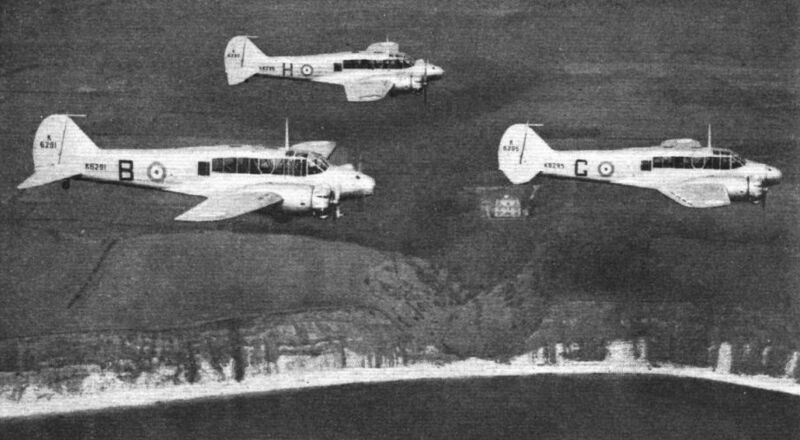 Avro Ansons are the aircraft of the general reconnaissance squadrons which patrol the waters round the coast of Britain. 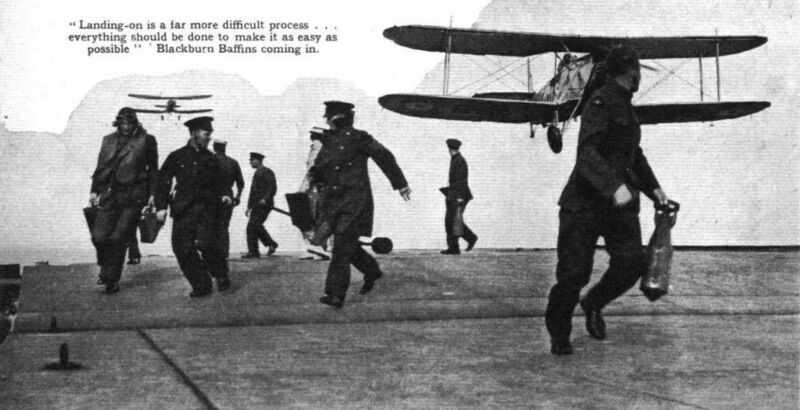 In a machine such as the new Blackburn fleet-fighter dive-bomber, seen here with one wing folded, high performance must not entail the sacrifice of load-carrying ability or practical folding and handling arrangements. 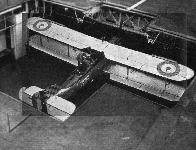 Intended for fighting and dive bombing duties the new Blackburn monoplane is fitted with a Bristol Mercury, which may later be replaced by a Perseus. 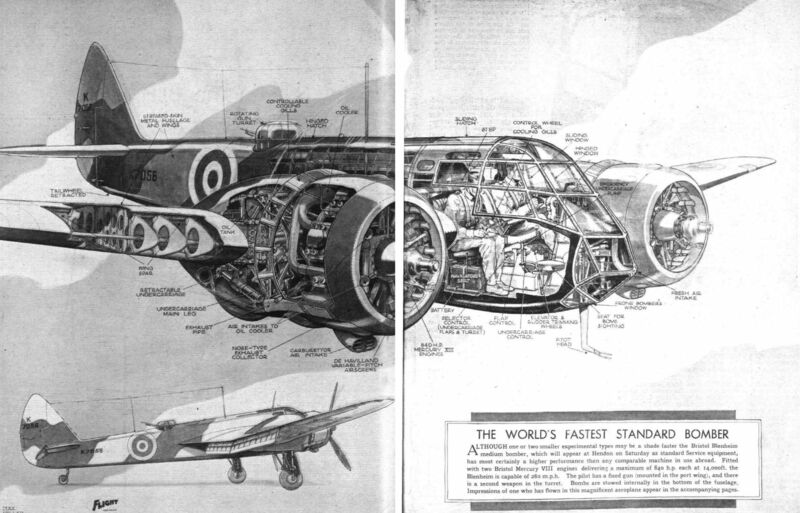 Built to the same specification - P.4/34 - the Fairey Merlin-engined light bomber are undoubtedly the fastest machine of its calibre in the world. 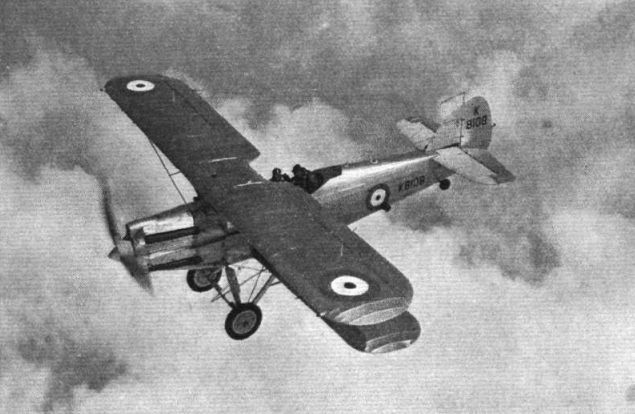 The Handley Page Harrow is in the same category as A.W. 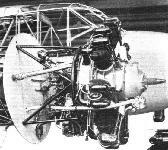 Whitley and mounts a pair of Bristol Pegasus engines. Typical aerodrome scene indicative of the colourful spectacles to be seen all over the country on Saturday, here, with a Harrow in prominence, at Biggin Hill. The Flight photograph shows the stern defence (conceived by the Nash and Thompson) of a Harrow. 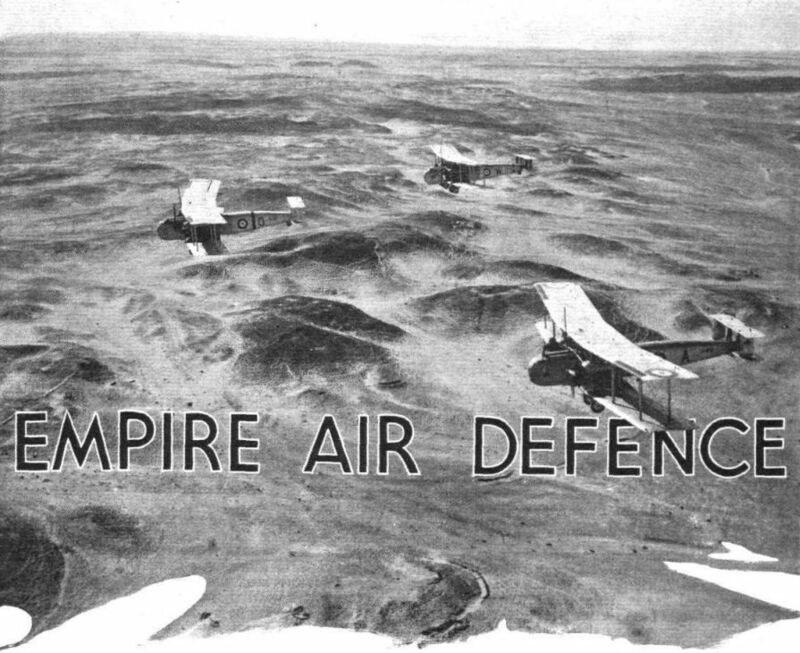 Deserts are quite a usual feature of overseas air work. Here Vickers Valentia transports are seen carrying supplies from Egypt to Palestine. 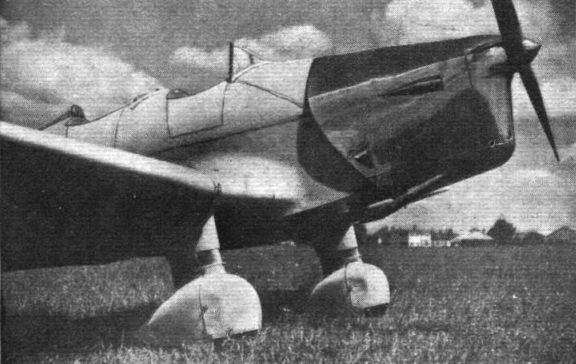 The most striking fighter in the Show - the Renard R.36. One of the most impressive transport aeroplanes ever built, the De Havilland Albatross is estimated to cruise at about 200 m.p.h. Its four engines are Gipsy Twelves. TRANSCENDENT TRANSPORT: Perfection of line and an unsullied exterior combine to convey the impression that this is not an actual photograph but a spurious representation of the Albatross in flight, achieved with the aid of a model. 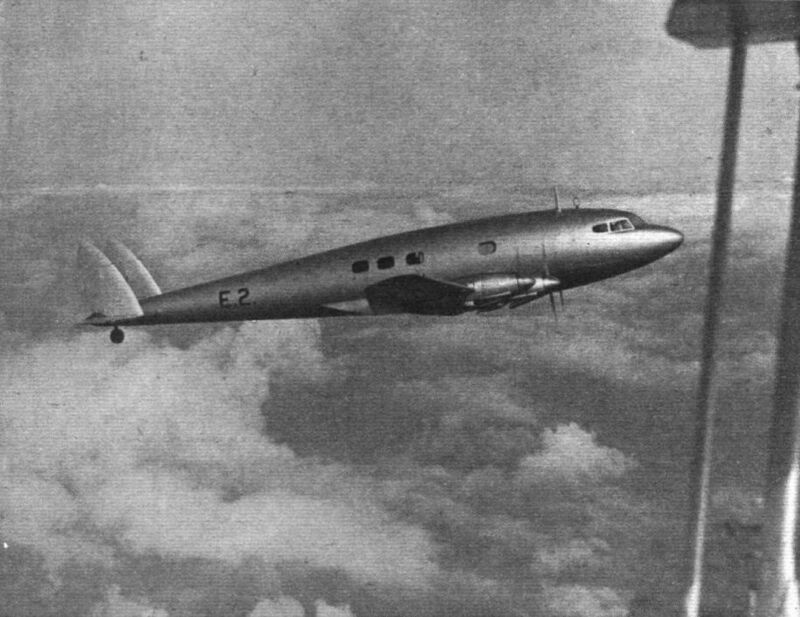 In actual fact, this revealing picture of De Havillands' masterpiece was secured by Flight's photographer near Hatfield last week during a test flight by Mr. Waight. 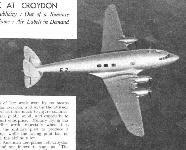 EARMARKED: Anyone who had been out of touch with aeronautical developments might easily recognise the Albatross as a De Havilland product. 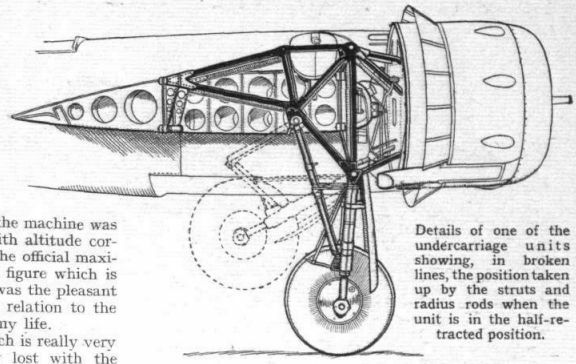 Although more-or-less orthodox in lay-out this ninety-first De Havilland design features many structural innovations and very advanced power plant installations. In the Bendix fluid-operated brake, as fitted to the D.H. Albatross, the piston in the operating cylinder forces apart two tappets which bear on the shoes. Some idea of the conditions prevailing at Douglas on Saturday can be gathered from this photograph of the first machine home - Mr. J. 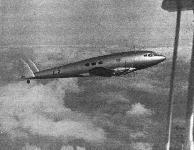 A. M. Henderson's Monospar - crossing the line at zero altitude. 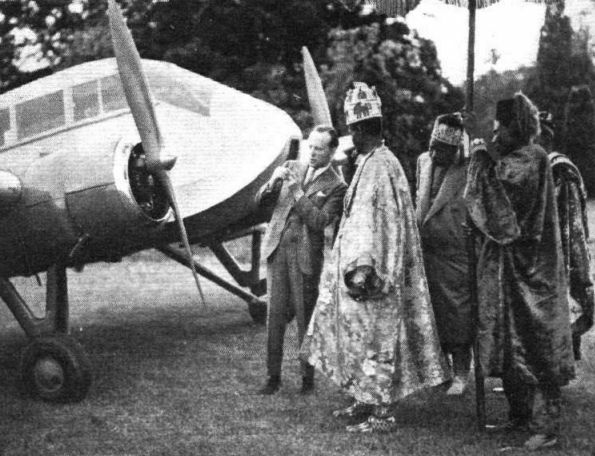 HANWORTH HOSPITALITY: During the visit last week of Ademola II, Alake of Abeokuta, Nigeria, to the London Air Park Lord Sempill explained various points of the latest Monospar and flew the Alake round for about half an hour. 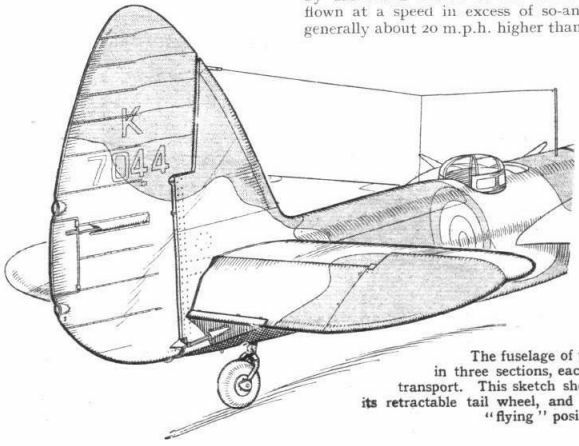 FLEDGED: The eagerly awaited Gloster multi-gun monoplane fighter, which, judging by appearances, should occupy an extremely small period of time in getting from x to y at the behest of the Mercury or the sleeve-valve Perseus, which are its alternative power plants. 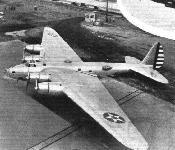 Note the forward position of the fin and rudder relative to the tail plane. 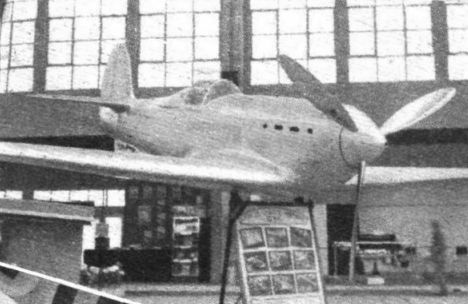 GLOSTER'S LATEST: A three-quarter-front aspect of the new monoplane fighter. Leading dimensions are: Span, 38ft. 2in. ; length, 31ft. 1in. ; height, 10ft. 1in. 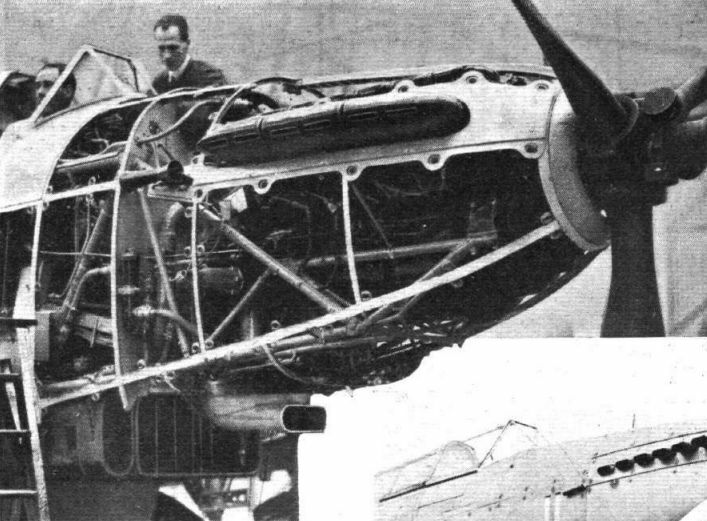 The new Gloster multi-gun fighter monoplane fitted, at the moment, with a Bristol Mercury engine. 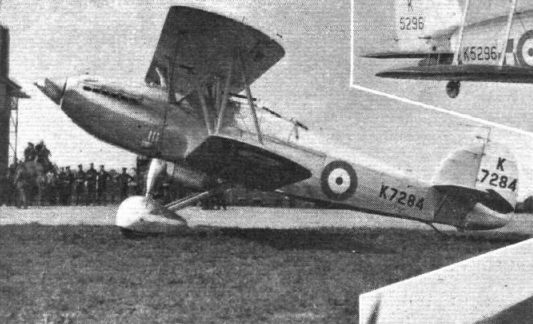 BACKGROUND: The latest of a long and brilliant line of Gloster fighters, the new multi-gun monoplane is designed to take a Bristol radial. 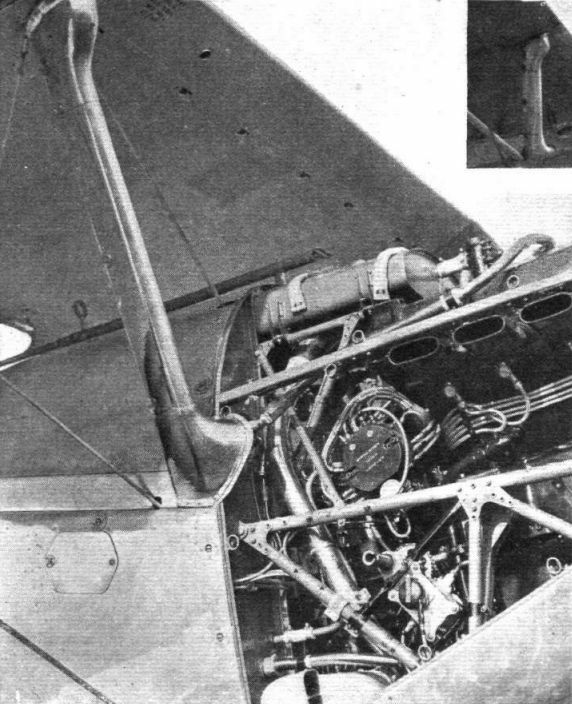 A Mercury is installed in the prototype, seen here looking in on Hawker's "-MR," but a sleeve-valve Perseus may later be substituted. Dramatic "shot" of Demons of No. 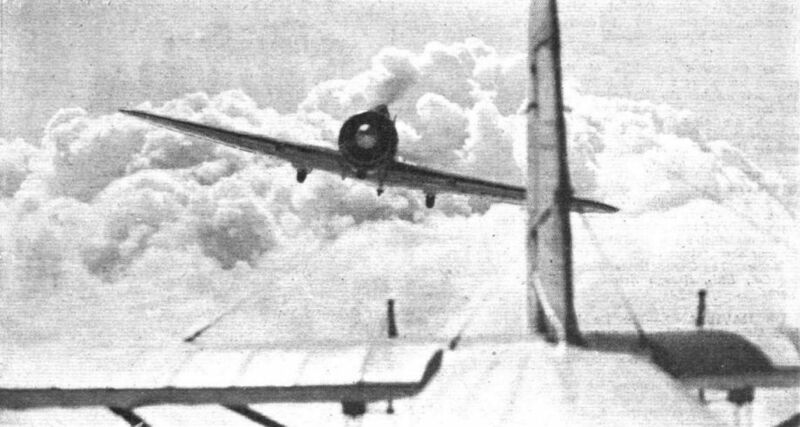 64 (F.) Squadron, the start of a dive-bombing attack over the sea. 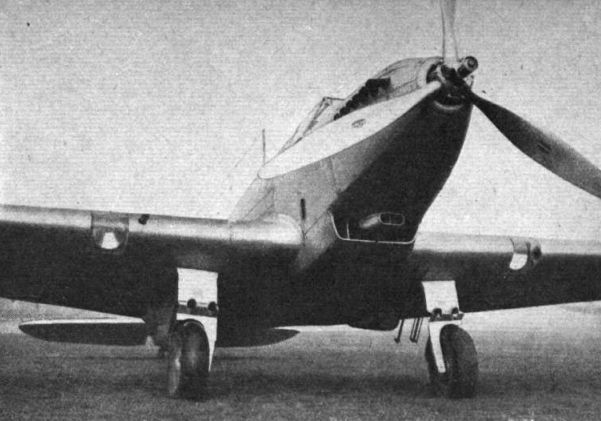 A CRUSTACEAN DEMON: The Nash and Thompson turret on a Hawker Demon. The shield portion is reminiscent of a lobster's tail and in this view is seen folded down, being linked with the elevating mechanism. 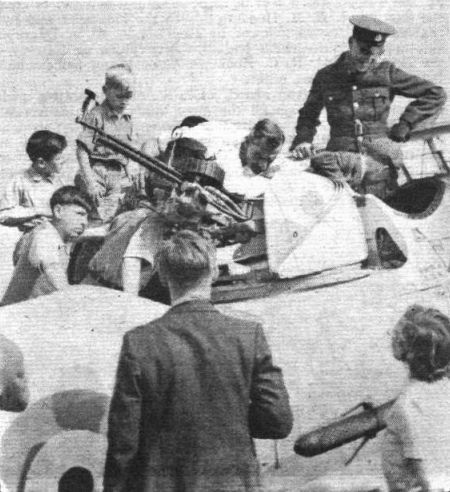 TOTS AND TURRETS: Some of the younger element at Saturday's Northolt display assess the merits of a Nash and Thompson turret of the Turret Demon. A "private-venture" machine, the new Miles advanced fighter-trainer is powered with a Kestrel XVI which gives it a top speed of 290 m.p.h. 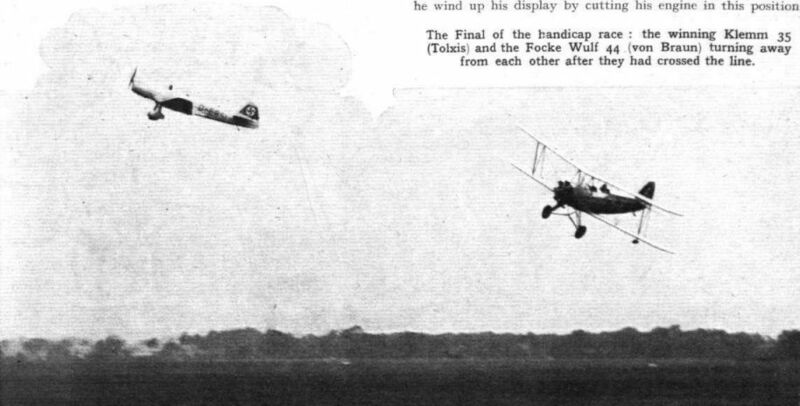 The eventual winner of the main race and runner-up in the Manx Air Derby, Major Seidemann, opens up his Messerschmitt for the take-off at Hanworth. In the background is the second B.F.W., which was piloted by Herr Gerbrecht. Finale: Herr Wendel (inset) winds up his demonstration with the Bucker Jungmeister with a high-speed inverted passage across the aerodrome at zero altitude. 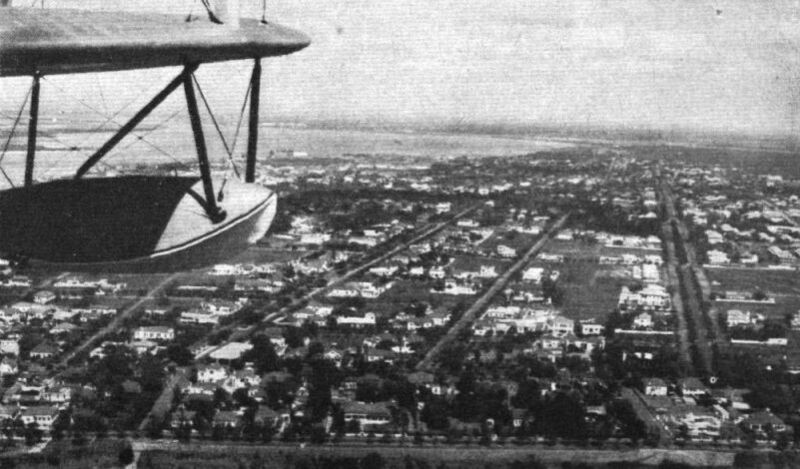 When this picture was taken he was climbing to avoid the Short Scion on the left; on his previous passage the Bucker's tail fin positively stroked the grass - to the terrified joy of the onlookers. 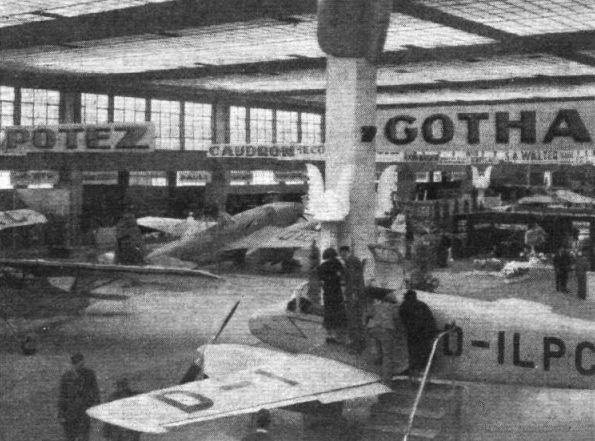 A general view of part of the Show with the new Gotha Go. 146 in the foreground. In the distance, on the French stand, is the military version of the Caudron Typhon. 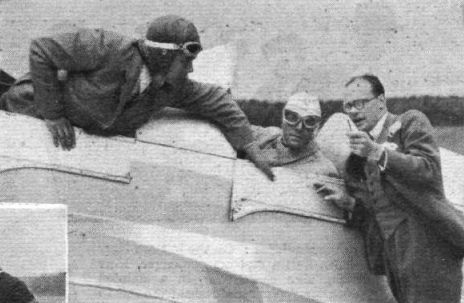 Herr Hellman Tolxis and Herr Ritsch, his passenger, who came over in a Klemm 35, are linguistically assisted by the ever-helpful Mr. R. L'E. Malone of Airwork. 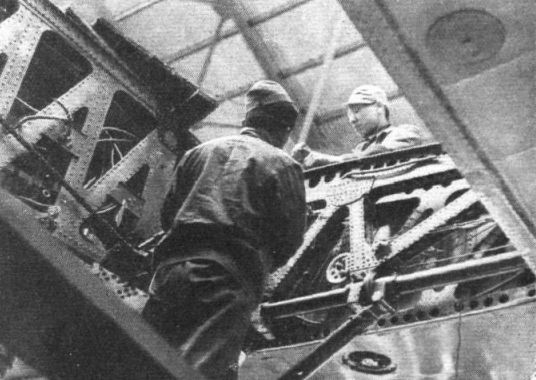 The view shows the installation of vee-twelve engine in the new Japanese long-range monoplane. The view reveals the substantial mounting. IN BELGIUM: The Beechcraft C.17R exhibited at the Brussels Show by Aviquipo. Surrey Flying Services did some high-pressure work in installing the machine at the show after it had been held up at Croydon awaiting an export licence. Incidentally, a rather novel brochure, "A Day in the Life of a Beechcraft," containing copies of an American commercial log, is issued by Surrey's at Croydon. The experimental XB-15 Boeing (four Twin-Wasps), which is even larger, but which, according to the latest information, has not been flown. 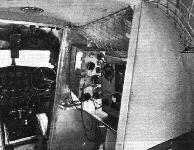 Marconi installation in a British Airways Lockheed Electra. 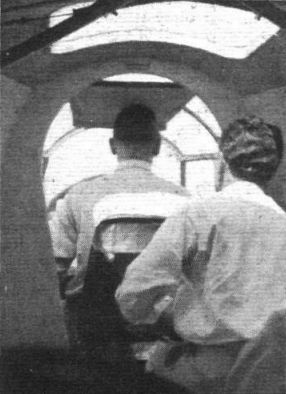 On the forward bulkhead is the receiver-transmitter unit, and in the cockpit roof is the D/F loop indicator which has a repeater on the panel in the foreground. The two Eagles (Fit. 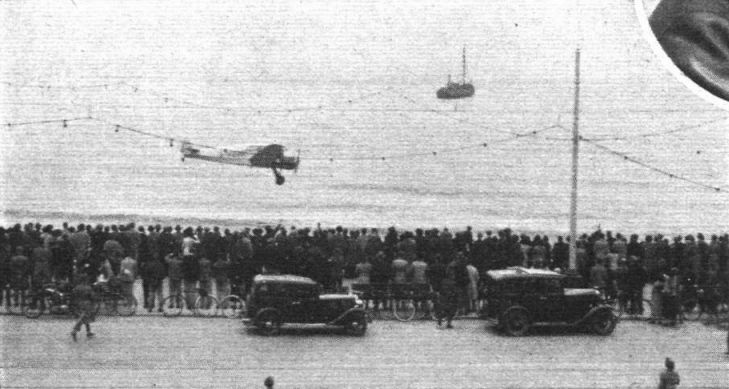 Lt. Rose and Mr. H. J. Wilson up) get away from Ronaldsway on the Manx race. Though they have hardly crossed the boundary - and have not started to put on bank for the turn on to course - the undercarriages are up. Fitters and riggers at work on a Hawker Osprey. 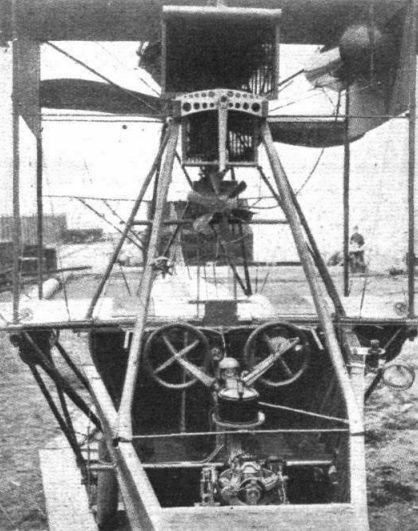 SPERRY PILOT NUMBER ONE: This 1915 Curtiss boat was equipped with a Sperry "Stabiliser" which can be seen in the nose at the bottom of the picture. 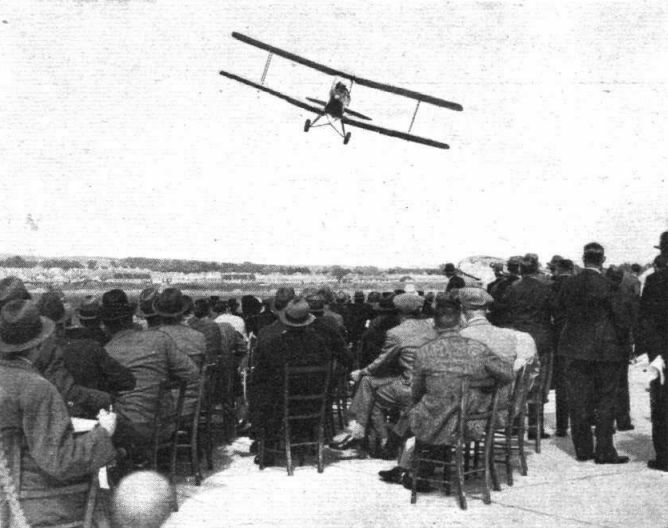 The "Stabiliser" was the real ancestor of the automatic pilot as we know it to-day. Blackburn B.2s of the Hanworth Reserve School show their paces. "Landing-on is a far more difficult process ... everything should be done to make it as easy as possible" Blackburn Bafhns coming in. 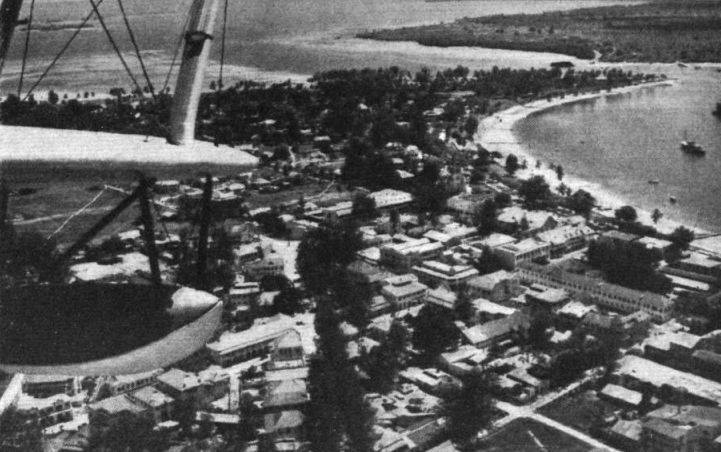 Under the Calcutta's float, in the photograph is the town of Dar-es-Salaam, with the harbour mouth on the right. The well-planned and seemingly spacious town of Lourenco Marquez - the last base before Durban, where S.A.A. take over the good work. "Entry into the arrester gear at too high a speed throws a great strain on both the aircraft and the deck cables." 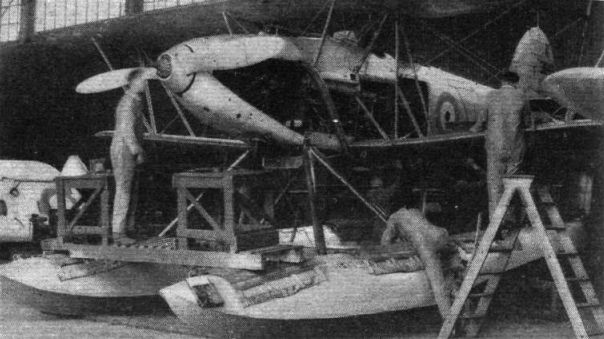 This remark of the author's can be readily appreciated by a study of this photograph, which shows a Hawker Nimrod being checked by an arrester cable on the deck of an aircraft carrier. 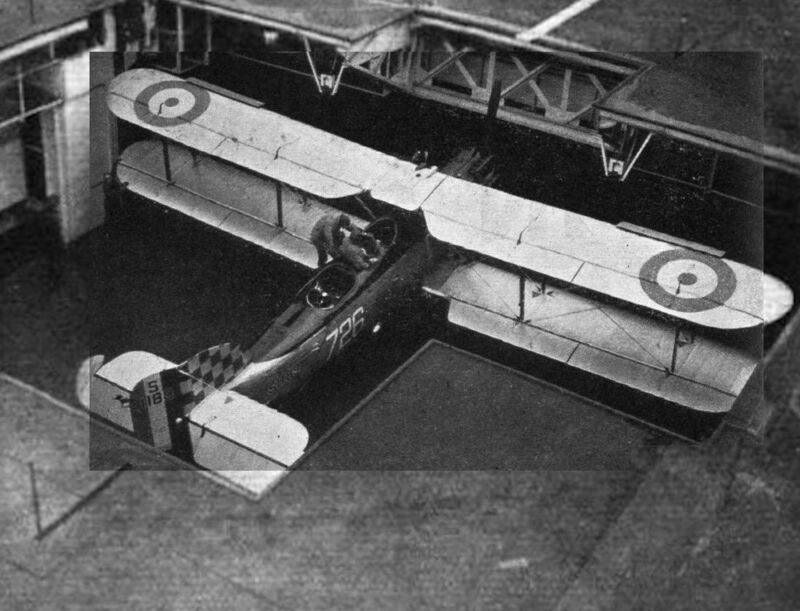 The illustration shows a Fairey III.F in the hold of the aircraft carrier H.M.S. "Courageous." 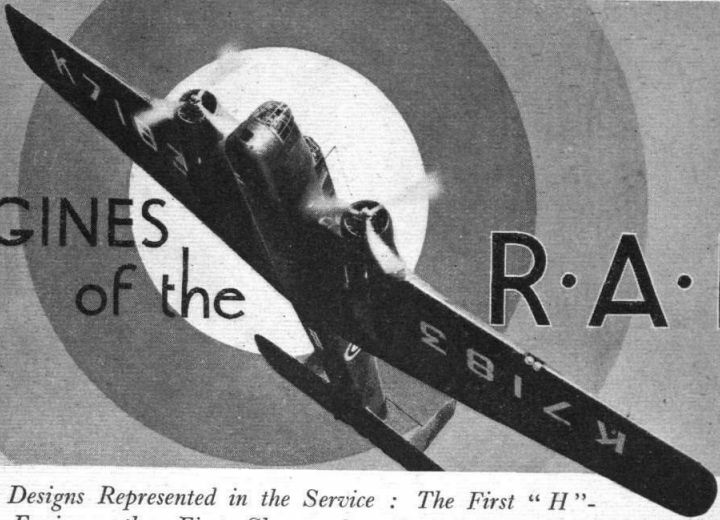 As an indication of their wide adoption for Fleet Air Arm operation, 12 units out of a total of 18 of this branch of the Royal Air Force are equipped with Fairey aircraft. 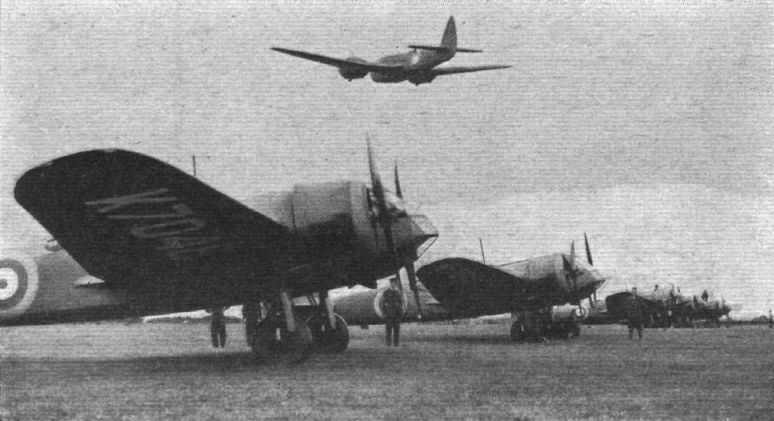 The impressive machines in the photograph are three of the thirteen Boeing YB-17 bombers, each fitted with four 1,000 h.p. 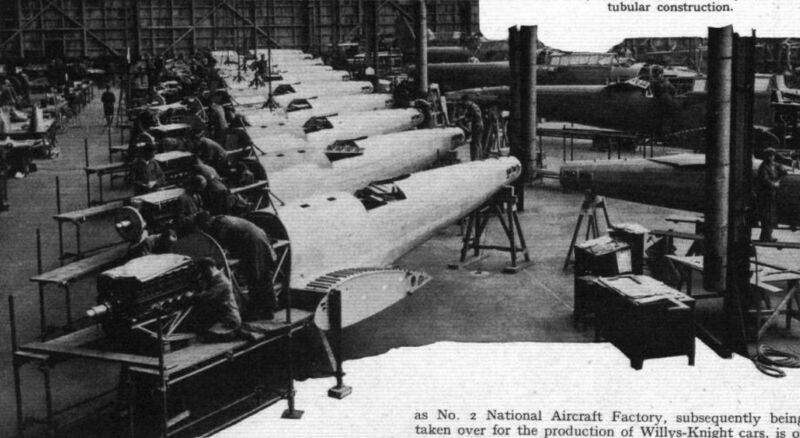 Wright "Cyclone" engines, ordered by the U.S. Army Air Corps. Mr. Pashley, in the Moth, is above the Law. 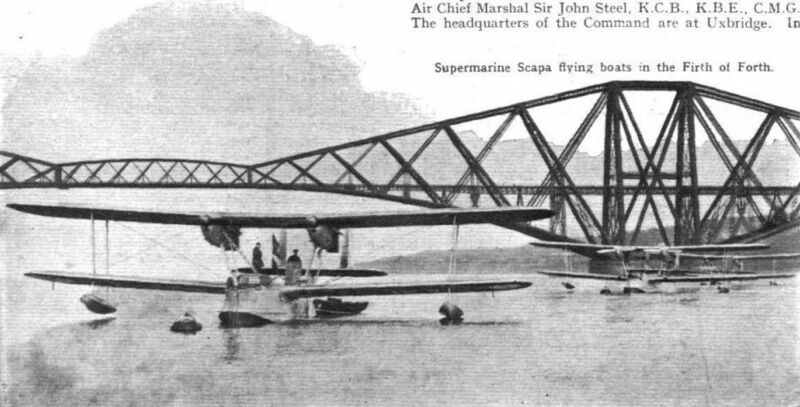 Supermarine Scapa flying boats in the Firth of Forth. Fit. Lt. J. B. Wilson (at the controls) and Mr. D. M. Bey (navigator) photographed in the B.A. Double Eagle as it crossed the Chilterns at 2,000ft. on the way to Speke. STRESSED SHIN IN MINIATURE. Capt. 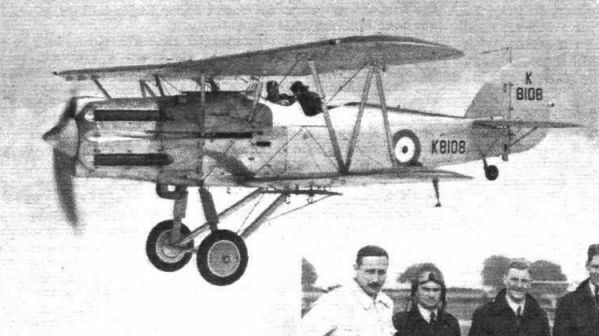 Hubert Broad flies the new C.W. Cygnet for the benefit of "Flight's" photographer. As will be seen there is a certain amount of cleaning up still to be done, but with a Cirrus Minor engine the Cygnet has a cruising speed of well over 100 m.p.h. and an 800-ft.-a-minute climb. 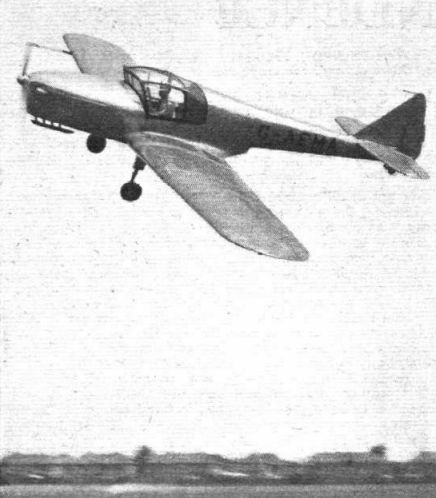 Among the new private-owner types was this attractive little side-by-side two-seater Oplinter monoplane, with Cirrus Minor engine.